I remember trying to come up with ideas for my wedding cake almost 10 years ago. It is such a personal thing but you want to keep it within the theme or you want it to reflect your personality or hobbies. 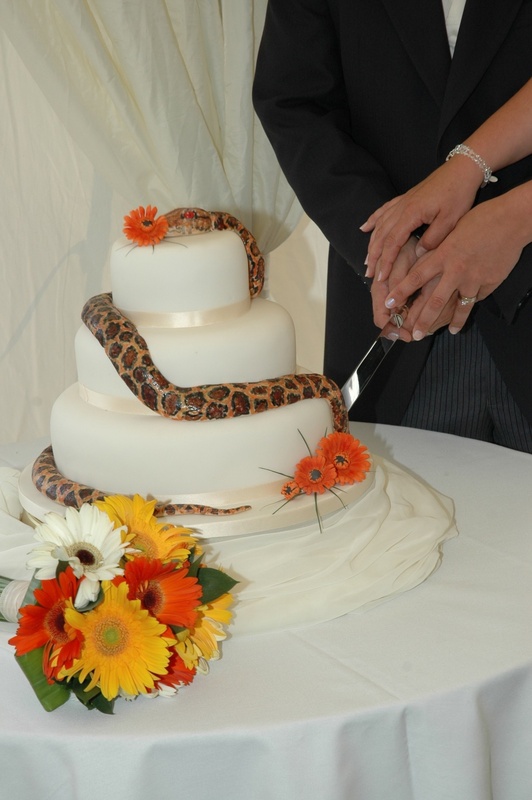 In the end we decided to stick to the theme with a simple three tiered white cake with orange gerberas but to add a twist, we had a snake draped around the cake with a gerbera in it’s mouth! My husband had been an avid snake keeper since age 11. Nowadays you can find all sorts of designs and even colours, but what is a traditional wedding cake and how did they come about? Looking as far back as Medieval times, wedding cakes were the centrepiece of the wedding often sitting in a place of honour. In those days, it was more likely to be a pile of buns instead of the works of art we see now but the symbolism remains the same. Budget – This is probably the most important thing to consider. Cakes can be very expensive but if you shop around you can find local suppliers that will help. You could even consider baking one yourself if you have the necessary skills…..unlike me! Style or theme – Every bride has their own ideas for a cake, whether it be a traditional style or a more modern day option. Some themes you could look at are retro, glamour, rustic, romantic or contemporary….the list is endless. Shape – No longer are you restricted to simple round tiers. You can pretty much opt for any shape or even sculpture depending on your supplier. Some other simple options are heart shapes, rectangular, square or even several tiers of cup cakes. Servings – How many people are coming to the wedding? In general 3 standard tiers will serve between 75-100 people. If you have a smaller wedding guest list but still want the 3 or more tiers, you can use ‘fake’ cakes. Once you have made your decision, found a great cake maker and have given them your design, all that you will need to do is cut the cake on the big day. Cutting the cake symbolises the first thing you do as a married couple, but back in Medieval times things were done slightly differently. The custom was to pile the buns together and the couple would try to kiss over the top of the pile. If they managed to kiss, they would be blessed with many children. It was also thought that this ritual would bring them good fortune. Looking at the height of some of these cakes nowadays, you’d have to be at least 7 feet tall to kiss over the top of them! I am going to be looking at everything to do with weddings over the next few weeks, so watch this space for more details of wedding traditions.